For other locations with a similar name, see New Philadelphia (disambiguation). 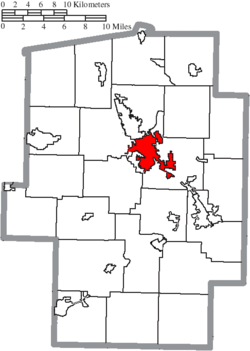 New Philadelphia is a city in and the county seat of Tuscarawas County, Ohio, United States. 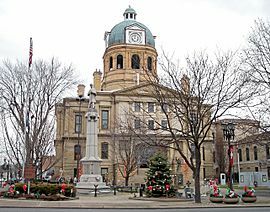 The county's largest city, it is located 71 miles (114 km) south of Cleveland, 119 miles (192 km) northeast of Columbus on the Tuscarawas River, and 397 miles (639 km) west of Philadelphia, Pennsylvania. New Philadelphia was established in 1804. Because of the presence of coal and clay, early industry in the city centered on mining interests and the manufacture of steel, canned goods, roofing tile, sewer pipe, bricks, vacuum cleaners, stovepipes, carriages, flour, brooms, and pressed, stamped, and enameled goods. The population was 17,288 at the 2010 census. New Philadelphia is adjacent to the city of Dover, which is almost the same size. 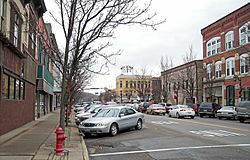 It is one of the principal cities of the New Philadelphia–Dover, OH Micropolitan Statistical Area, which includes all of Tuscarawas County, and is part of the larger Cleveland–Akron–Canton, OH Combined Statistical Area. The Moravian Church founded Schoenbrunn ("beautiful spring") in 1772 as a mission to the Delaware Indians. The settlement grew to include sixty dwellings and more than 300 inhabitants who drew up Ohio's first civil code and built its first Christian church and schoolhouse. Problems associated with the American Revolution prompted Schoenbrunn's closing in 1777. 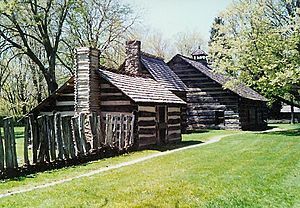 The founder, John Knisely, returned to Ohio in 1804 with his family and 33 other pioneers, he also hired surveyor John Wells to plot out New Philadelphia in the same grid style as Philadelphia, Pennsylvania. In 1833, New Philadelphia contained county buildings, a printing office, several stores, and five taverns. 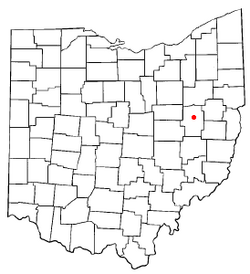 New Philadelphia is located at (40.489411, -81.447324), along the Tuscarawas River. It lies within the ecoregion of the Western Allegheny Plateau. According to the United States Census Bureau, the city has a total area of 8.39 square miles (21.73 km2), of which 8.22 square miles (21.29 km2) is land and 0.17 square miles (0.44 km2) is water. New Philadelphia's design was based on the design of Philadelphia, Pennsylvania. The two main streets in the city are High Avenue and Broadway, both of which were named after two main streets from Philadelphia, except, in Philadelphia, High Avenue was renamed Market Street in 1858, "the High Street" was the familiar name of the principal street in nearly every English town at the time Philadelphia was founded, and Broad Street is the closest street name in Philadelphia to Broadway. No historical records exist for a road named Broadway in Philadelphia. The chief way to reach Dover is through 4th St NW, which is renamed the Boulevard in Dover. The street features four-lane streets with medians. Right before Dover it opens up and features a Wendy's, McDonald's, Arby's, and Burger King with a Taco Bell being slightly past the border. As of the census of 2010, there were 17,288 people, 7,282 households, and 4,541 families residing in the city. The population density was 2,103.2 inhabitants per square mile (812.1/km2). There were 7,909 housing units at an average density of 962.2 per square mile (371.5/km2). The racial makeup of the city was 94.0% White, 1.2% African American, 0.4% Native American, 0.6% Asian, 0.4% Pacific Islander, 1.6% from other races, and 1.8% from two or more races. Hispanic or Latino of any race were 4.2% of the population. There were 7,282 households of which 27.8% had children under the age of 18 living with them, 45.3% were married couples living together, 12.3% had a female householder with no husband present, 4.7% had a male householder with no wife present, and 37.6% were non-families. 31.4% of all households were made up of individuals and 12.6% had someone living alone who was 65 years of age or older. The average household size was 2.32 and the average family size was 2.87. The median age in the city was 40.4 years. 21.9% of residents were under the age of 18; 8.7% were between the ages of 18 and 24; 24.9% were from 25 to 44; 27.6% were from 45 to 64; and 16.8% were 65 years of age or older. The gender makeup of the city was 48.5% male and 51.5% female. As of the census of 2000, there were 17,056 people, 7,338 households, and 4,659 families residing in the city. The population density was 2,188.0 people per square mile (844.3/km²). There were 7,796 housing units at an average density of 1,000.1 per square mile (385.9/km²). The racial makeup of the city was 96.89% White, 0.97% African American, 0.18% Native American, 0.49% Asian, 0.06% Pacific Islander, 0.49% from other races, and 0.93% from two or more races. Hispanic or Latino of any race were 1.33% of the population. There were 7,338 households out of which 28.0% had children under the age of 18 living with them, 48.9% were married couples living together, 11.3% had a female householder with no husband present, and 36.5% were non-families. 31.7% of all households were made up of individuals and 13.2% had someone living alone who was 65 years of age or older. The average household size was 2.30 and the average family size was 2.88. In the city the population was spread out with 23.0% under the age of 18, 9.4% from 18 to 24, 28.2% from 25 to 44, 23.7% from 45 to 64, and 15.8% who were 65 years of age or older. The median age was 38 years. For every 100 females there were 90.7 males. For every 100 females age 18 and over, there were 87.1 males. The median income for a household in the city was $33,235, and the median income for a family was $42,896. Males had a median income of $32,157 versus $20,363 for females. The per capita income for the city was $18,745. About 7.7% of families and 10.2% of the population were below the poverty line, including 12.7% of those under age 18 and 6.2% of those age 65 or over. Tuscora Park in New Philadelphia features a carousel, Ferris wheel, and other rides. Tuscora Park is a municipal park that features a carousel, Ferris wheel, train and other rides, along with miniature golf and batting cages. Tuscora Park was originally built as a project of the Works Progress Administration; original stone work gates, paths and retaining walls still adorn the park. The park is now the home of the Park Place Teen Center, a facility for high school students that provides entertainment of all types. Events at the park include a Summer Showcase and the annual First Town Days festival. The Summer Showcase is held in the Tuscora Park Amphitheater. Events at the amphitheater include Sunday church services, plays and concerts featuring local talent. On the last day of the First Town Days festival the park hosts the U.S. Air Force Band of Flight, which plays in the amphitheater. Around 1940, New Philadelphia purchased the Herschell-Spillman carousel secondhand. It is a rare all-wooden carousel. It includes 36 carved wooden jumping horses, two chariots and 428 individual lights. The center panels are adorned with 14 original oil paintings. Music is provided by a Wurlitzer 153 band calliope. The carousel is 40 feet in diameter and weighs 10 tons. It was manufactured in 1928 by the Spillman Manufacturing Company of North Tonawanda, New York. David Miller is well known for his 40 years of service on the Tuscora Park Carousel. The First Town Days, which includes a Grand Parade and fireworks display, runs on the weekend leading up to the Fourth of July. The company that manages Tuscora Park is a non-profit, RTY Inc. The organization frequently hires high school and college students to operate rides and sell tickets. New Philadelphia, Ohio Facts for Kids. Kiddle Encyclopedia.